The kitchen is the very heart of any home, and for me it was the first room I got together in our new home. Even before we officially moved in, I knew I needed to have the facilities to be able to offer beverages and snacks to the friends and family who worked so hard to help me get in through the door. For me the kitchen is one of the most important rooms in the whole house, after all it is where you spend so much of your time. 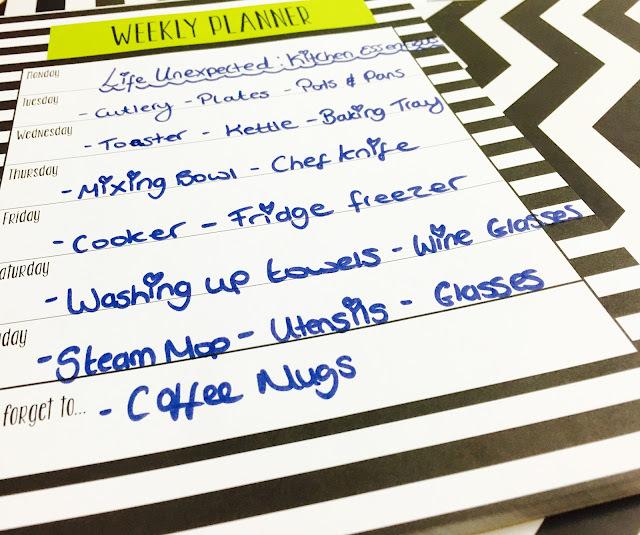 You’re in there preparing the food, washing the dishes and preparing for the busy day ahead. It is where I get little man his breakfast and sign his reading record, it’s the room that we as a family spend so much of our time. As many readers know, Leo and I have spent the last 2 years back at my parents home, moving our entire lives back under their roof was no easy feat, and after living on our own prior to that meant that we had the entire contents of our old home to find homes to store it. 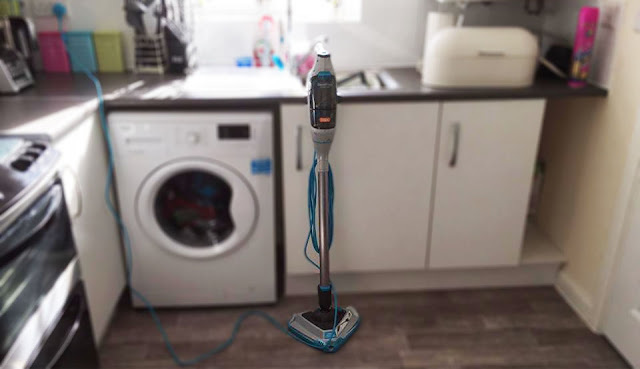 When I first found out about the house move, I thought we would be pretty much set, and I didn’t think that we would really need to much in order to be ready to move, but of course that would have been too easy. Everything that had been in storage had not faired too well over the last few years in the garage, so I made a list that was soon as long as my arm, and knew that we had to make a start somewhere. I wanted a vintage looking kitchen with a hint of modern shining through, so I opted for some fun typography that I actually designed and printed myself, purchased some inexpensive frames from B&M Bargains and set them on the kitchen wall. I purchased a cream bread bin, kitchen roll holder and washing up tub and paired the sink off with a chrome washing up rack. I decided on a Black Beko Fridge Freezer, and a Stainless Steel Black Zanussi Cooker I liked the idea of the contrast between the pale walls and additional items I had selected. I think the Monochrome additions combined with the contrast of the Red feature canvas has really made a statement in this room. As the kitchen it’s self isn’t the largest in the world, I have tried to conserve space by slipping a White breakfast bar along the back wall with 2 bar stools. This has been a great addition for us as it has meant that I can keep the consumption of food within the confinement of the kitchen, and means I can keep the living room entirely for entertaining, relaxing and out a desk in the space that I have left over. It’s nice having the option to have space to sit down to eat without compromising on space and altering plans I had for other rooms. I love the simple colour ways because it means you can jazz a room up in other ways, and if you suddenly decide on a complete colour change, you can add as much or as little as you like. I look around the kitchen and suddenly feel like a real grown up. When I think back to the kitchen we had at the old house and our jazzed up union jack knife set, I feel like the style I have incorporated into our new kitchen has most definitely matured. The modern touches I have added in fall mainly within the small appliances, we have a beautiful Toaster and Kettle set from the Hotpoint Ultimate Collection. They are both Stainless Steel and unlike any other set I have ever had in the kitchen before. The Kettle allows you to set the temperature to suit how you want your beverage to be enjoyed, this means that if you want to boil the water to a suitable temperature that can be enjoyed straight away, you can! It heats up quickly and really stands out on the side, everyone who has stepped for in the kitchen so far has been really ogling the kettle, so it’s definitely turning some heads for all of the right reasons. The toaster is made with the same Stainless Steel and can hold 4 slices of bread at any one time, and even though it’s just Leo and I living here, you would be surprised how much toast we have been getting through (we are currently head over heels for Bacon Sandwiches!). The Hot Point Set is digital, so you can adjust them by just using the display buttons, and the toaster even tells you how many minutes until your toast is ready. When it comes to getting everything that you need for your very first kitchen, I think it is important to make a list of everything that you will need to get started, and once you have that list have a think about the budget you can allocate in order to purchase everything that you need. I prepare a lot of fresh fruit and vegetables, and if you have ever tried to cut a Mango open you will know just how challenging it can be! I welcome tools that make my meal preperation that little bit easier, and the Oxo Spiralizer is an incredible kitchen addition because of it's compact size. I was using a full size Spiralizer up until this point and I always found it a nuisance to clean. The OXO Good Grips Hand Held Spiralizer takes up little to no draw space and is really easy to clean. 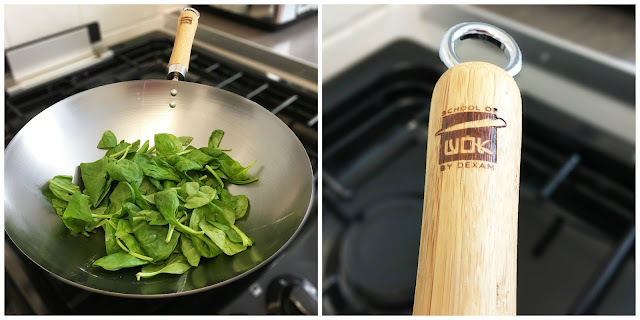 When you cook as much as I do you want good quality cooking equipment, whether I am cooking up a big bowl of Pesto Pasta Bake or dreaming of a big stir fry full of colourful vegetables. I want to know I have a pan to suit every single culinary whim that enters my mind. One of the top essentials I need in the kitchen, is a blender. I enjoy a good smoothie, and as I eat a lot of fresh food, I like to have the power in hand to be able to prepare my own sauces and dips. I even make my own Pesto and raw snacks so I need a serious bit of kit that won't let me down. The Nutri Ninja Complete Kitchen System has ticked all of the boxes for me. It is everything I need in one complete package, so you get the food processor element, high speed blender and Nutrient Extractor. So now you don't need to run out and buy a food processor to do the things that the blender is quite simply not cut out to do, it's 3 appliances in one extremely handy appliance. Better yet it comes with 4 different jugs each with different capacities. You have the 2 smaller sizes which are the standard size with the original Ninja models, and then you have the 2 larger ones. I usually use the food processor capacity so I can put more ingredients inside. It is by far the most powerful system I have used and the first of it's nature that has been able to handle everything I can throw at it. In the past I have managed to make a competitor model smoke, it was quite simply not able to handle the workload that I required from it. The Nutri Ninja Complete Kitchen System looks great on the work top and doesn't take up too much space, which is exactly what I needed due to my work tops not being as big as I would like. I'm a stickler for a clean kitchen, and because it is where the dog spends his nights it means I like to be completely on top of cleaning the kitchen floor. 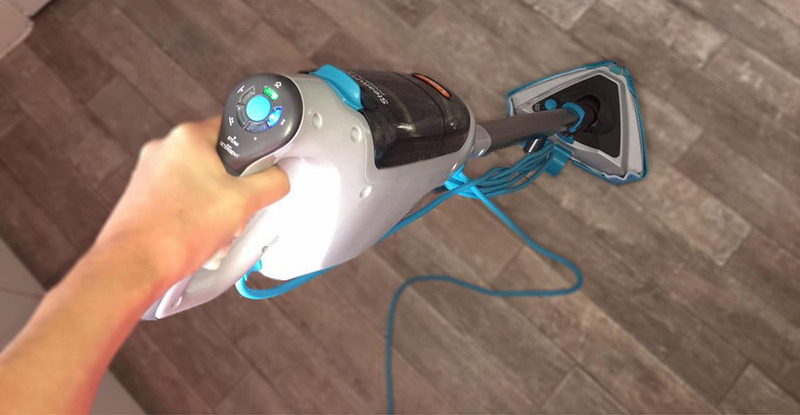 For this we have the Vax Steam Fresh Power Plus Steam Cleaner. It has been an absolute god send with a puppy roaming around, especially with the little accidents that are inevitable when house training. There has been mornings when I have entered the kitchen to find a sea of piddle, and I have instantly relaxed the moment I realised that it wasn't an issue, I could just pop the steam mop on and make sure it was all cleaned up properly. 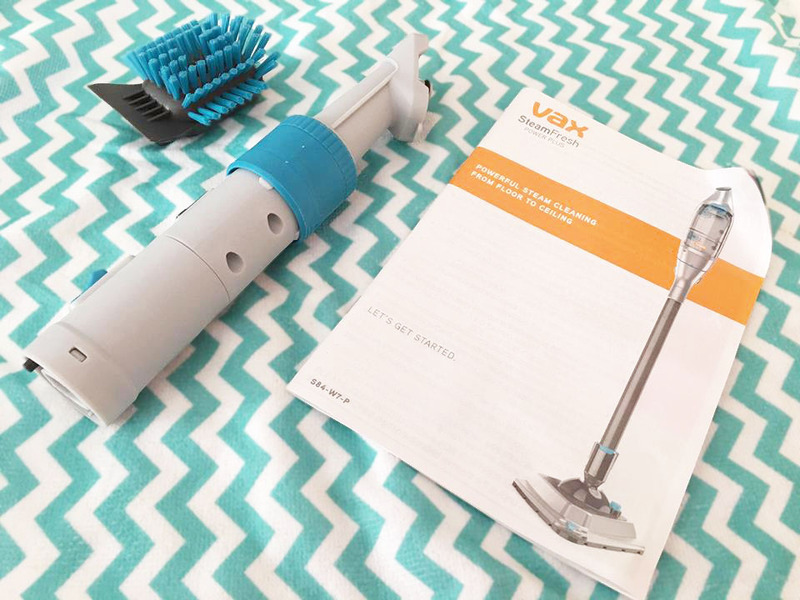 So why is the Vax a touch above the rest? 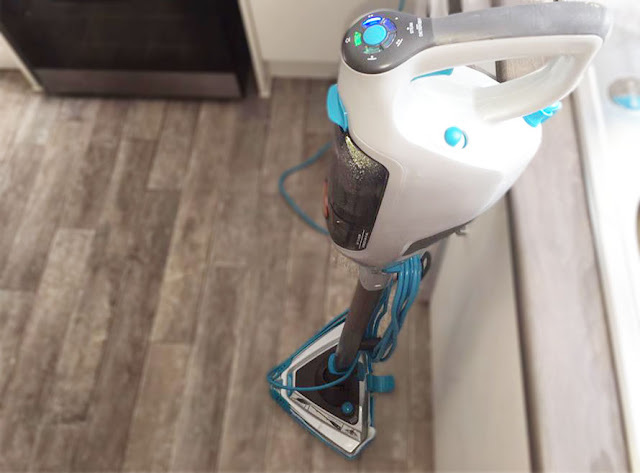 I have to start with just how easy it is to maneuver because that is a massive factor for me (360⁰ connector & adapter), secondly all of the cleaning modes use a combination of steam and detergent to help break down grease and grime much more effectively. It even comes with 250ml of Detergent to start you off. 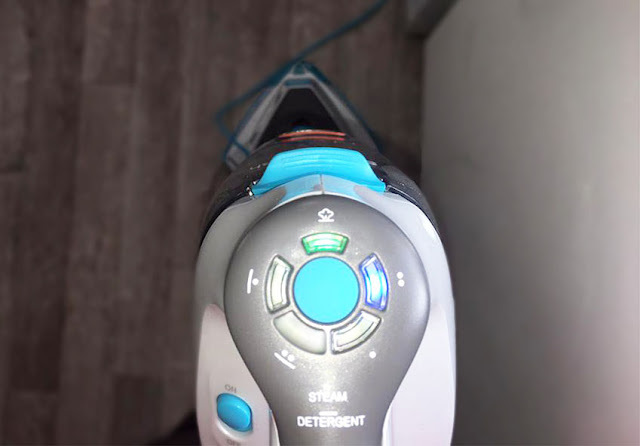 Thirdly the steam head is so powerful, and this is only heightened with the inclusion of the steam boost function so you can really get those pesty stains that don't want to come away. It isn't just for floors though, you can literally clean from floor to ceiling. This means that it isn't just a steam cleaner for the kitchen, this opens up possibilities all over the house. You can get up into the corners of those hard to reach areas with ease (and without breaking a sweat which is what I am in it for! ), you can ever use it on cooker hoods and bathroom tiles (It's perfect for bathroom tiles! ), and all of this is what makes the Vax Steam Fresh Power Plus such a dynamic house hold addition. This concludes the Life Unexpected's Kitchen's Essentials, but over the coming weeks ahead I will be sharing a number of titles within this series. We are slowly getting there with the rest of the house, and I cannot wait to uncover each room and show you what we have been up to over here! Disclaimer: I was provided the above products for the purpose of this feature. All views and opinions are completely honest and my own. Well that's another Summer vanishing into the horizon, and in it's place are crisp Autumn leaves and subtle hints that colder weather is on it's way. I have to admit that as much as I love the Summer months, I also adore this time of year. There is something magical about the way the leaves change colour, the way the nights draw in invite you to cuddle down under a fluffy throw on the sofa with a hot chocolate to warm you from the inside out. There is just something satisfying about getting to wear wooly clothing and slip on your knee high boots for the season, and I think that is one of the aspects I love most about waving farewell to the sunshine for another year, it's the wardrobe possibilities. My typical September wardrobe would usually consist of a pair of boots, dark denim jeans and a nice thick jumper with the potential for a thick woolly wrap around for that additional layer to keep the chill off my body. I feel the cold all the time, I am one of those people who would be sat in a room full of people with my coat on while everyone else is wondering what is wrong we me as they are all feeling the heat! The last few months have literally been all about getting everything ready for the house move, so every spare penny that I have had, has been ploughed into everything that we need for the move, and of course furnishing the house to put our own personal touch on the place. 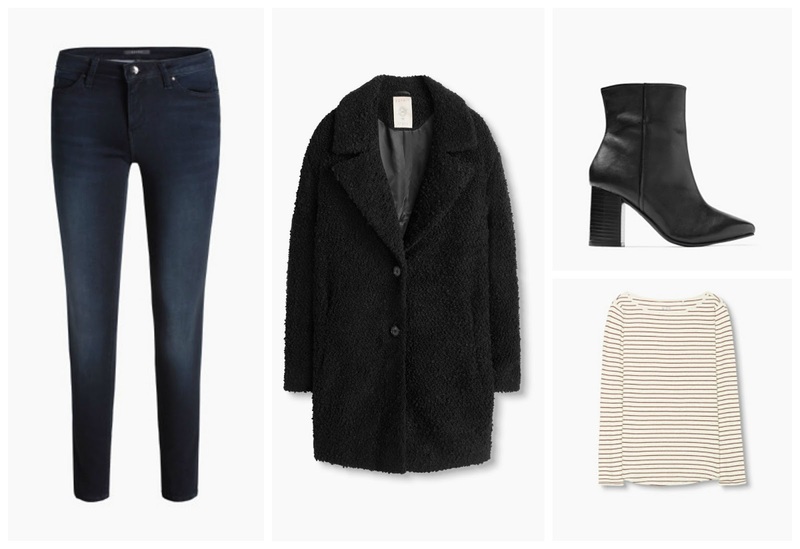 Now we are in and the majority of the essentials list has been ticked off, I am looking forward to being able to update my wardrobe for the colder months ahead. Sometimes we take treating ourselves forgranted, and it's not until your in a position to not buy these things that you realise what a luxury it really is. I cannot remember the last time I went on a shopping trip and allowed myself to splurge, all I seem to have done recently is count pennies to make sure that Leo and I have everything that we need. What we have wanted has had to be brushed under the carpet until we were in a position where there was some expandable income at the end of the long list of bills. That makes this upcoming shopping trip an extra special one, because it follows a particularly hard year (there might be a post on this at some point, but the jury is still out), that has ultimately seen me stand on my own two feet and get Leo and I into our very own space, just the two of us. I have to say that I am feeling pretty proud of myself right now, I look around the house and although there is still so much to do, I can actually see it taking shape, It's already feeling like home to both Leo and I, which just makes the late nights and hard work to get here, absolutely worth it, and now I can get back to a normality that allows me to make a few purchases every now and then, because we all have to treat ourselves occasionally...Right!? We have had Lux at home with us well over a month now, and that time has literally flown. It feels like we have always had him, like he has always had a place in this crazy little family unit. That might be because he has literally doubled in size in the last month and his spots have become even more prominent! Lux is absolutely beautiful and were already so in love with him, there is absolutely no doubt in my mind that he is meant to be with us. Leo and Lux have a relationship forming everyday, and although it usually consists with the arguing and play fighting that usually occurs between two siblings, the love they share for one another is something that you would have to be blind not to see. Lux will lick Leo all over, and it was just last night that Leo's hair was sodden from all of the puppy kisses that Lux had bestowed upon him. Lux sleeps in the kitchen at night, and if I am busy running about I will put Lux in the kitchen so he can't cause any mischief (believe me when I say that he is ALWAYS up to no good! ), and now when I open the kitchen door to come and put some more washing on, or take the wet washing out to hang on the line, Lux seizes the opportunity to bolt out of the kitchen and up the stairs to where a sleeping Leo is sound asleep. The arrival of the dog will usually be lots of licks and nibbles, but sometimes he will just sit quietly at the end of the bed and keep guard over his little human. Of course I always bring him back downstairs, much to Leo's disappointment as he would love for Lux to sleep on his bed, but I want Lux to realise that his bed is in the kitchen and I don't want him to grow accustomed to needing to be with us 24/7. We actually recently moved into our new home, and that first night there with Lux was difficult. I put him in the kitchen with his bed, made sure that he had absolutely everything that he needed and then took myself upstairs. Lux proceeded to cry and howl for half an hour. I sat at the top of the stairs contemplating what to do, thinking of the neighbours next door and looking at the clock. It was gone 11pm. The longer I sat there the louder Lux got, and I knew that if I moved and went to see him now I was setting the precident for how things would be going forward. So I sat there and waited it out and then all of a sudden he just went quiet, and that was him asleep for the night. Each night the crying got less and less and now he goes to sleep with no crying at all. It's hasn't all been easy, and it's definitely not been a walk in the park. I have discovered first hand just how much hard work puppies can be (if there was any chance of me considering a second... I no longer am! 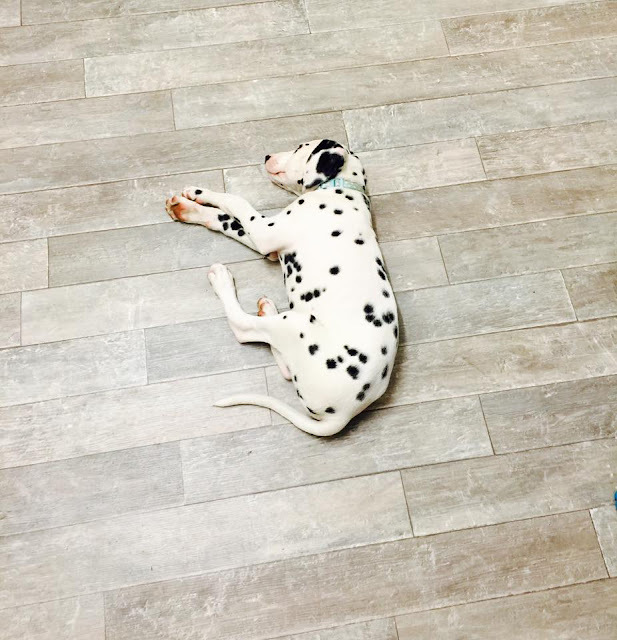 ), I didn't enter into this lightly though and knew from the get go that I was going to have my hands full, what caught me off guard more than I ever expected is the puppy nipping. I have never had a puppy before so I wasn't sure how much or how little was the norm for this type of thing, and whether the level of Lux's biting was down to his breed or because he was just being naughty. 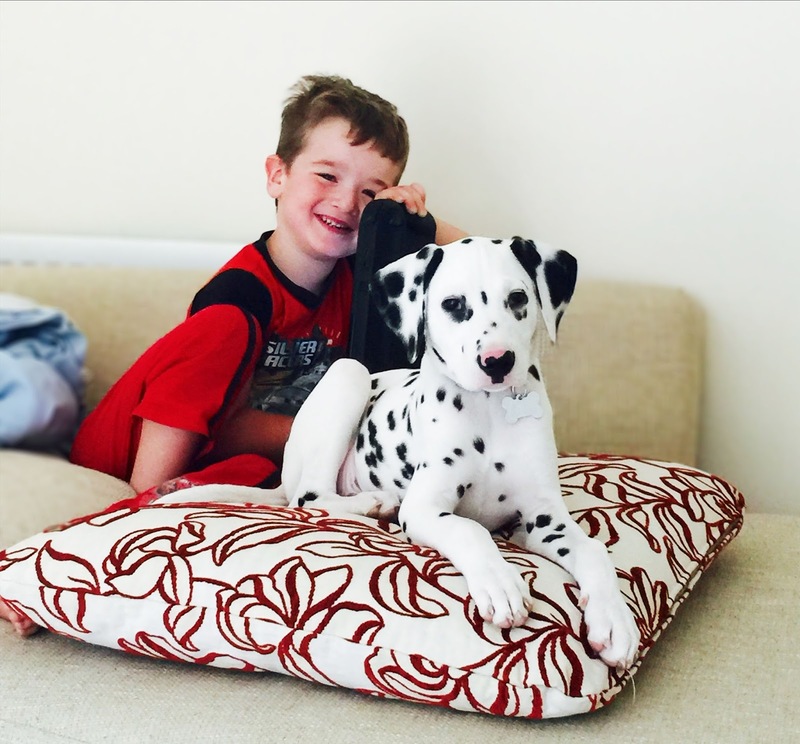 I have been really lucky in the sense that I found a group on Facebook with thousands of other Dalmatian owners, and they have been incredible with all of their advice and support. 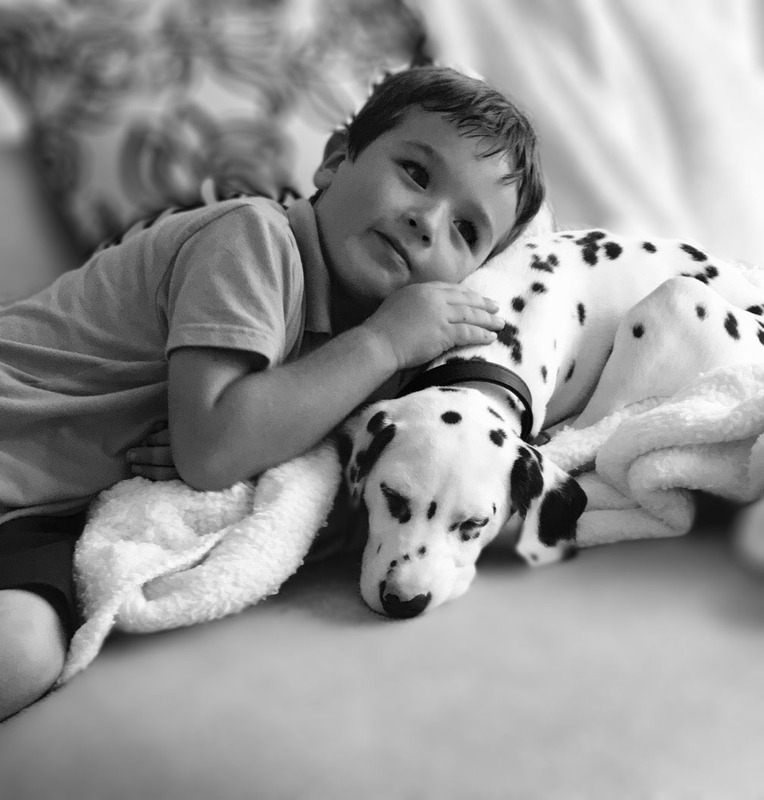 Turns out Lux is just your typical Dalmatian puppy and although this phase has seemed pretty hard, it will soon pass as long as I keep demonstrating the consistency when dealing with it. When Lux gets too over excited and starts nipping, I have been letting him know that we don't appreciate this behavior by either removing him from the situation for a time out, or yelping loudly and gently pinning him just like another puppy or dog would do. Lux has been the ultimate celebrity with friends and family, they have all made the effort to come and see him, but when they were expecting to come and see the cute, sleepy puppy, they have soon had their illusions shattered after they have come face to face with the playful pup that I have been tempted to rename Jaws *Insert Dun Dun, Dun Dun tune here*. Lux does seem to be responding to these tactics that we have been implementing with him slowly but surely, and although he still nips, he seems to be learning how to control his bite. Ultimately the idea is that we teach him to bite gently at the beginning and then remove the behavior all together. Lux's jabs have now all been completed and we can head outside for short walks which has been incredibly lovely. 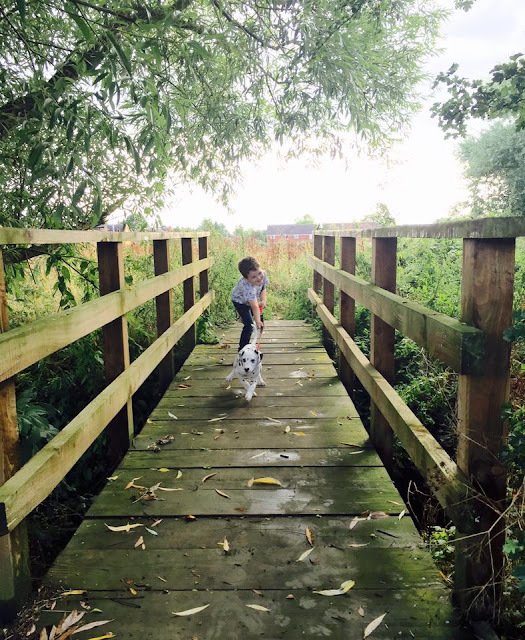 Where we now live is right next to a beautiful camp site with a massive field including a short woodland walk, and we are lucky enough to be allowed access with Lux to enjoy the land. I had never really considered just how social dog walking was, but in the weeks that we have been outside with Lux, I have met so many incredible and interesting people who I would never have been able to get talking to if I wasn't one of their fellow dog walkers. 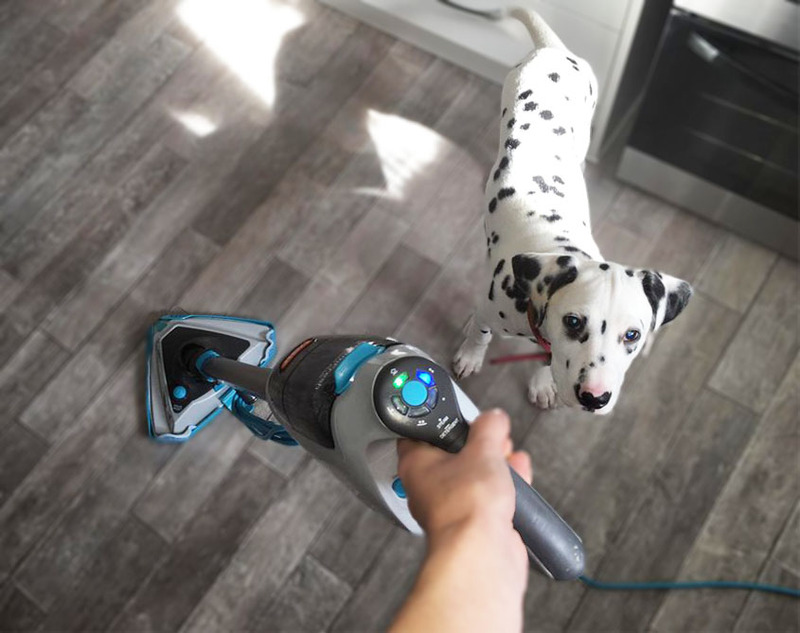 As you don't see many Dalmatian's around, Lux is always a topic of conversation and it really is as though I am walking around with a celebrity at the end of my leash. Of course Lux laps up all of the attention and has been absolutely loving meeting all of the other dogs. He has gone from being over cautious and his tail falling between his legs, to bounding about and wanting every other dog to play with him, I have quickly learned that Lux is quite a dominant personality and we are definitely going to have to get those puppy classes booked in sooner rather than later! We have been walking Lux on a collar and lead to start with, but because he pulls so much (imagine Marley and Me, then double that image!) we are going to switch to a harness. Rosewood Pets sent us over a lovely one that is too big for us to use right now, but I know that at the rate Lux is growing, it's only a matter of weeks before he's in it securely! As I sit and write this Lux is sat at my feet and undoing my shoe laces with his teeth, he knows it's almost time for us to go on a walk. 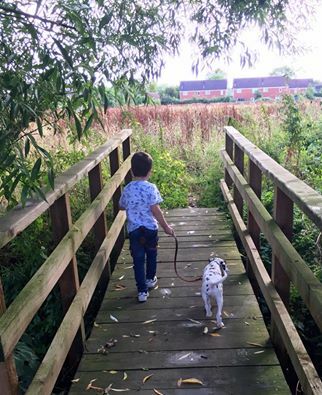 Today we are going to take a stroll into Evesham and enjoy Lux's first walk by the river. The summer has been an incredibly busy time for Leo and I, the reception year passed in the mere blink of an eye and before we knew it we were hurtling towards the 6 weeks holiday. You may have noticed a few tumble weeds around the blog over the last few months, and that is because we have literally been on fast forward since the school bell rang on the last day of the Summer term. If I thought that the Summer break was going to be a relaxing time, then I hope I can be forgiven for at least hoping for a few quiet weeks... Or even days for that matter. You see over the Summer holiday we got a puppy, moved house, Leo learned to ride his bike without stabilizers and we even attended a wedding! When I write it down in short bursts like that, it doesn't sound like we did all that much, but the move alone has completely knocked me for six. 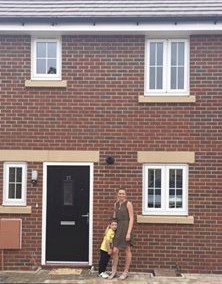 Don't get me wrong I am absolutely in love with our new home, I feel so incredibly lucky, and I finally feel like I can give Leo the space and time that he needs in order to flourish to his full potential. What I didn't anticipate was just how much time and money I was going to have to throw at the move, of course I had put some savings behind us because a move is always costly, but I had no idea just how expensive carpeting an entire house would be! We had to work around the carpet fitter, and slowly but surely started to bring our worldly belongings over to our new home. It was so surreal packing our entire lives into boxes and black plastic bags, but thankfully as I had begun getting everything we needed together months before the move actually happened, I could pretty much get the kitchen up and running as soon as we had the keys! It was the other rooms I had to wait a little longer on. We are now in the house and it's all starting to feel a lot more like home, I still have lot's of work to do to my room as I am currently without a wardrobe, but it's not the end of the world. Leo's room is starting to take shape and the rest of the house is pretty much there, all I need to do now is add those essential finishing touches. I am beginning to put together a home decor series that will be hitting the blog in the coming weeks ahead, I am just waiting on sorting a few last minute bits and pieces. My bedroom is still in utter chaos and will be until I can find the pennies to put a wardrobe in there! The summer brought with it a new milestone and Leo lost his very first tooth. It was a funny turn of events because I just did not see it coming. One morning while I was brushing little man's teeth, his entire tooth just moved with the brush, to say it caught me off guard would be the understatement of the year, and of course my shock in turn scared Leo, who proceeded to smack me over the head in a panic. I soothed him right away, we had already talked about how it would start happening soon, and that it was of course nothing to worry about. Leo did not touch that tooth and it hung on by a thread for weeks, until the morning of August 2nd while Leo was eating his cornflakes it came away and was swallowed into the depths of his tummy, gone forever. I have to admit I was slightly disappointed as I had been planning on keeping his first tooth, just like I had his very first curl. We decided to write a letter to the toothfairy and let her know the fate of Leo's first tooth, and thankfully she took pity on us and left Leo a £1 coin along with a letter under his pillow. Loosing one tooth over the holiday didn't seem to suffice for Leo however, and a couple of day's before the return to school, we discovered he had a second wobbly tooth! This time Leo didn't leave it alone, he wobbled it day and night. 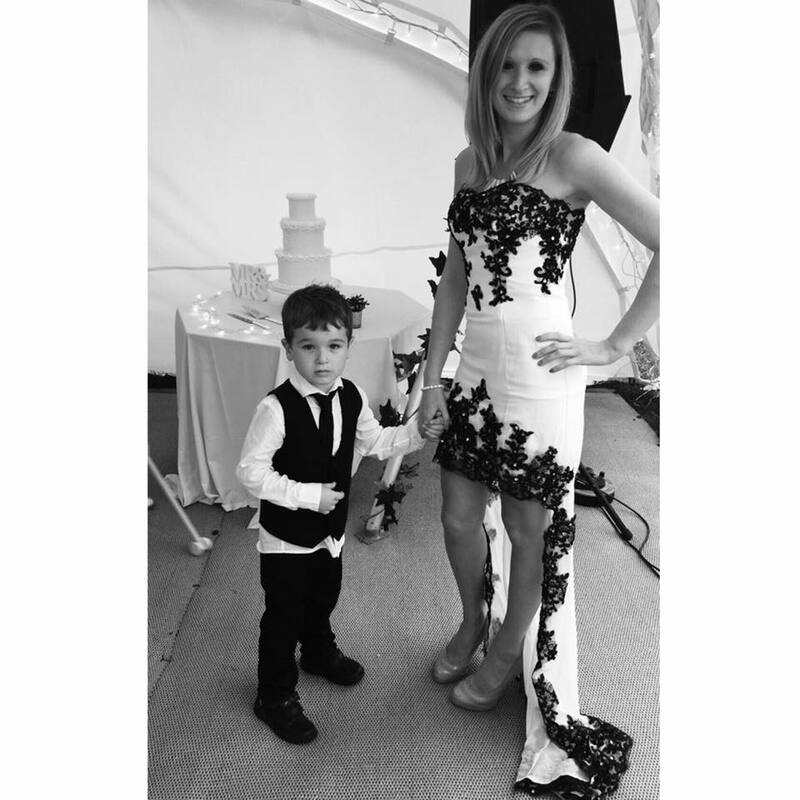 He wobbled it through my brother's wedding, even allowing his little cousin to give it a wobble too... Of course he waited until the night before he went back to school to pull it out. He had been in bed and asleep for hours, but at just gone 11pm Leo burst into the living room to announce that his tooth had fallen out and we needed to get it under his pillow as soon as possible! The poor old toothfairy was caught so far off her guard that she had no spare change whats so ever. Instead... She placed a £5.00 note under his pillow. Here's hoping Leo doesn't expect this for each and every tooth! 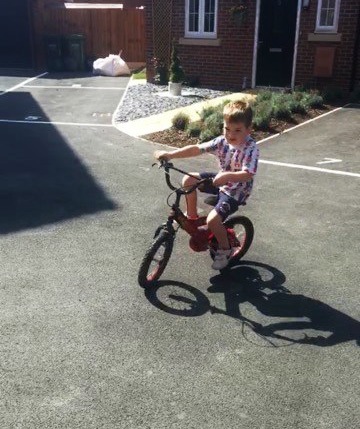 If loosing teeth wasn't a sure enough sign that my little boy is growing ever bigger, then him suddenly hopping on a neighbors bike (without stabilizers) certainly told me! I was so worried and told him over and over to be careful. Of course he quickly brushed my concern off and pretty much told me to relax. In fact his exact words were these 'Mummy I bet I can ride without stabilizers! Watch!' and so I did... and he was right. Without any practice or guidance from myself or his Daddy, Leo took off on a bike without any assistance at all. I couldn't help chuckling to myself as all the global delay comments trickled to the forefront of my mind during this proud moment, because when that boy sets his mind to something, you best believe he is going to smash it! It is for this very reason I have made a pact with Leo in regards to his learning, and that pact is this. If Leo co-operates with me and tries his hardest, I will buy him the biggest Nerf Gun I can find when he learns to read. Now this is an especially big deal because I have always told him that he will never own a Nerf Gun, but it's something that he has desperately wanted for such a long time, and the greatest incentive I could ever offer him. Leo has been back at school for one whole week now, and he has read to me each and every afternoon without any objections and he has been really giving it his all. So here we are at the start of Autumn, and here I am back behind the laptop catching up on all of my emails and the posts that I can't wait to write, and it's time to start smashing all of Leo's goals and give the teachers something to talk about!